The Hot Air Balloon Ride over the Gold Coast Hinterland was a preview of a very different side of Gold Coast. Thankfully, the Queensland Tourism Team decided not to leave this as a teaser. They treated us to a day trip through one part of this Gold Coast Hinterland. Soon after the Hot Air Balloon Ride, we set off for the Springbrook National Park. My early morning ride in the Hot Air Balloon had already set the pace for the day. The green mountains and pretty streams that I had seen from above, definitely needed a closer look. In fact, with this tour, I realized that these were even more beautiful than what appeared from the height. They added a different aura to the whole Gold Coast experience for me. 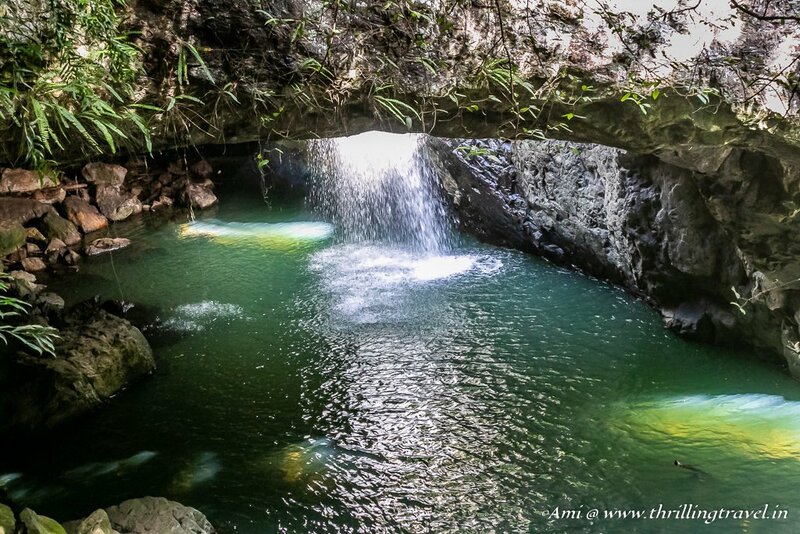 I would highly recommend that you add Springbrook National Park to one of the things that you need to do when in Gold Coast. Most of you know how our Earth was one big happy continent called Gondwana until the forces of nature forced it to separate into different parts. Australia too was a part of this huge mass. 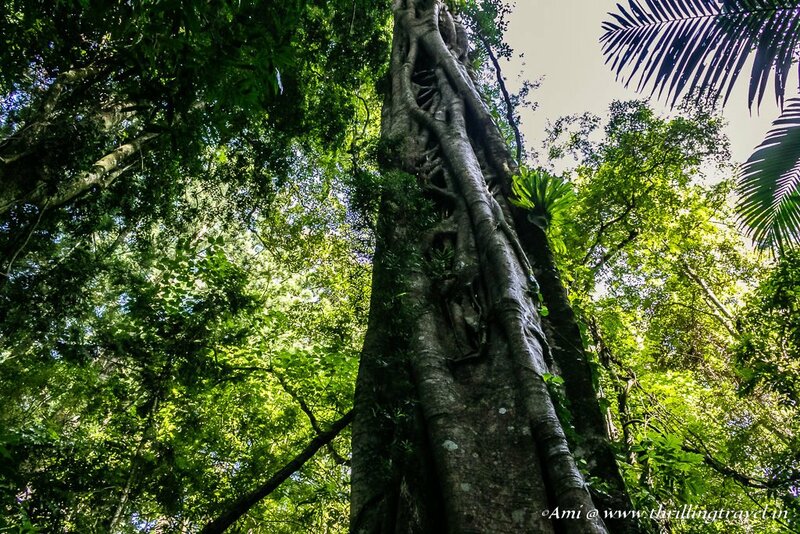 The proof of this Gondwana environment are in fact, still found in the form of fossils – in the Springbrook National Park. This signs of this evolution of the Earth have now been preserved as a UNESCO World Heritage Site. 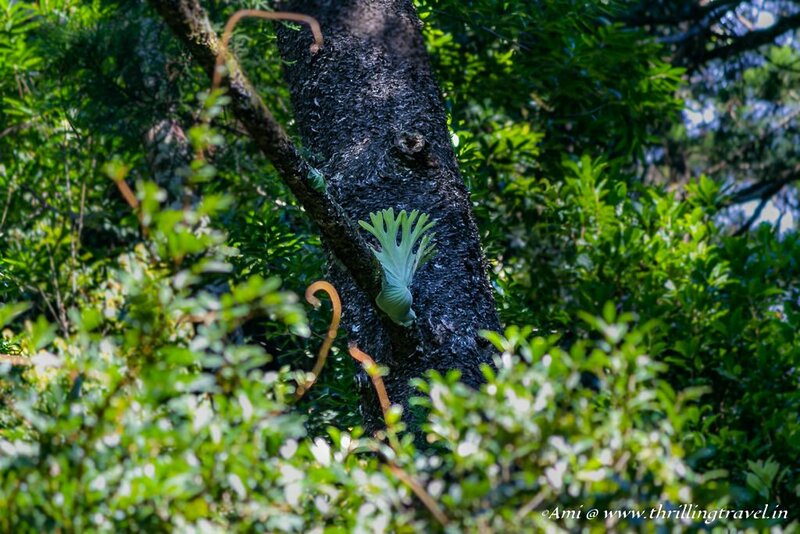 You can still see species of the same flora and fauna that existed thousands of years ago and this is what makes the Springbrook National Park so important. Besides the important living history of this place, I found myself enthralled by the gorgeous landforms of the Springbrook National Park. It was like seeing my desktop images come to life. Caverns with waterfalls, Eucalyptus forests, large canyons and the bright colors of nature – there was so much to enjoy here. There are plenty of walking trails that allow you to see these. However, for our day trip – we embarked on just three of these. 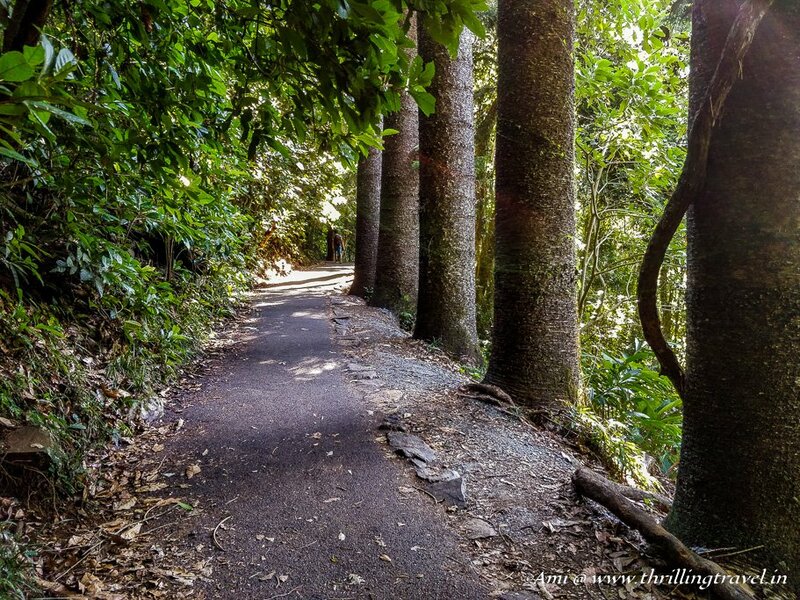 So, let’s jog along these memories of my walking trails of the Springbrook National Park. Even the weather Gods were on our side that day. A bright and sunny day, with clear skies that ran patterns to make the Gold Coast city even prettier. I am thankful to Hina for having let me sit by my favorite window seat. It was an absolute pleasure to capture all that I saw in my mind and camera. 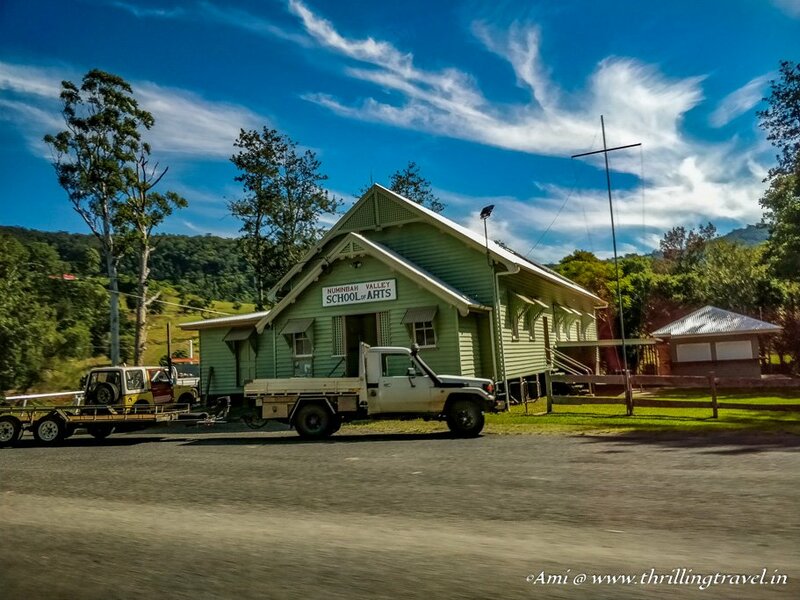 The beautiful blue canals of Gold Coast slowly disappeared and out came, the green valleys of Numibah. Little fields with picket fences and pretty horses appeared at regular intervals. We even passed a few lone churches and primary schools. It was quite enriching to see the life outside Gold Coast city. Even though I had been up since 3:30 am (remember the Hot Air Balloon ride), I barely slept. Even the few nods were reluctant as I did not want to miss anything that was being shown live on my huge Window Screen. Thankfully, before my Will lost the fight with my tired eyes, we stopped at the entrance of our first trail to the Natural Bridge. Our skipper said that this particular trail was just about “1 kilometer and very easy. Just a small incline with stairs but rest, not an issue.” While was making it easy for the others on the tour, what he did not realize was that my face was getting smaller and smaller. In my mind – “What? That’s it 🙁“. However, this trail made me realize that – it wasn’t about the distance, even that one kilometer could throw enough surprises to stun you. A well-marked cobbled pathway led us through dense foliage where the silence was broken by the sounds of chirping birds and a free-flowing brook. I caught sights of pretty lorikeets but they were camera shy and managed to avoid the shutter quite deftly. At regular intervals, our skipper would stop to show some of the valued flora. Like these strangler trees, that grew on any unsuspecting tree and slowly took over its host. They apparently, sucked them out their lives and made the tree trunks quite hollow. The path turned to a point where we saw the River Nerang fall over a stone arch into a cavern. This was the Natural Bridge. The scene was just so epic that there was a collective “Ooh” from the group as we all feasted our eyes on it. The best part of this view was that you could enter the cavern from one side and witness the waterfall from within. The green emerald lake in the dark cave with a curtain of white looked like something out of a fairyland. In some ways, it got me back to my visit to Dawki river in India. Who knows, with the Gondwana continent, they were related. The magical aspect of this cavern was that it was actually a Glow cave. The ethereal effect of the glow worms lit this cave at night – a scene that could only be witnessed if you embarked on a nocturnal adventure through Springbrook National Park. With that luminescent scene in my mind’s eye, I reluctantly followed the rest of the crowd out towards the rest of the trail that went around the Natural bridge, back to our bus. Our next stop came up even before I had gotten over the alluring Natural Bridge. However, this was not really a walk. The Purlingtonbrook falls could be seen just a few meters from the bus itself. The falls looked tiny but seemed to fall down quite a height. Unlike the gushing waterfalls of Meghalaya in India, these ones seemed tame but still beautiful. Our Skipper mentioned that one could hike down to the falls along a path but for that day, it was not to be done. He also, assured us that down below, lay the actual beauty of the Purlingtonbrook falls. His vivid description did make me want to go for the hike. Guess, that will be a good enough reason to get back to the waterfalls of Springbrook National Park. 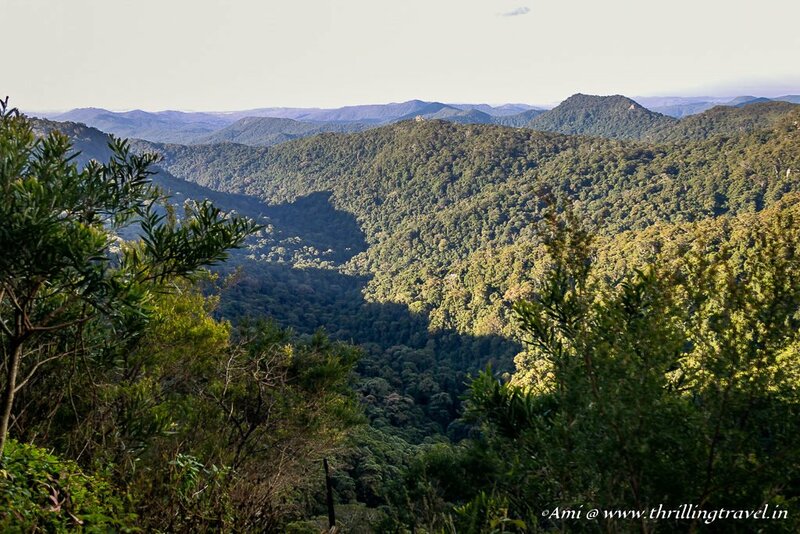 The next viewing point too, was a short walk to an expansive landscape – a huge wide gorge with sandy summits from a lone stream fell to the depths of green woods – gurgling out from the Eucalyptus forest atop. The Canyon Lookout was definitely a sight to behold. Before we got to the vantage point, we stopped at an intersection of Beechwood trees. These definitely need a mention for they are around 2000 years old – Antartic Beechwood trees. If you are a “Lord of the Rings” fan, then this place will give you a feeling of Deja Vu – with its gnarled roots and dense green cover. Past that, you reach this point where the rest of Gold Coast stands before you. You can see the coastline at the far end that looks even more enticing through the mist of the Gondwana region that you are standing at. 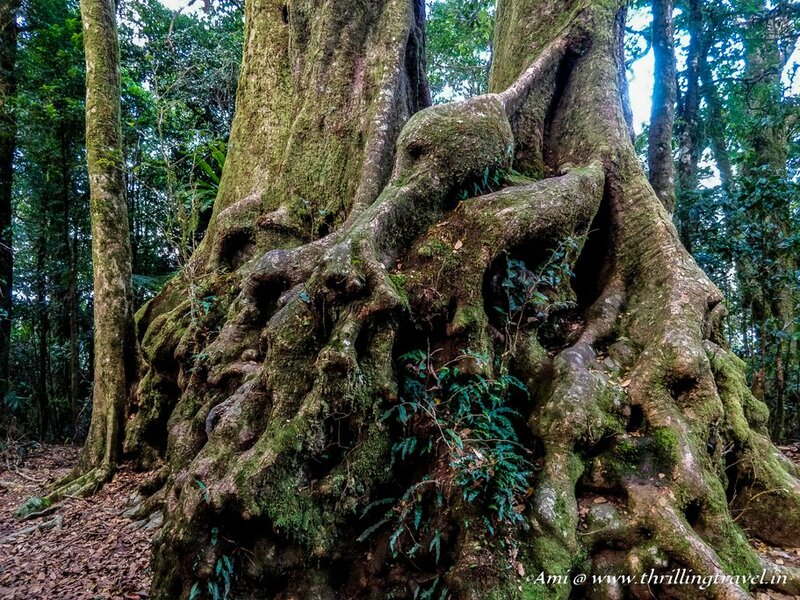 Springbrook National Park is a heady combination of nature and heritage – where the latter is of a different kind. I have always enjoyed the heritage through monuments and ruins but this was one of the few times, where I enjoyed it through the living remains of ancient earth. Now that you know of this rareity, I am pretty sure that you have marked the Springbrook National Park as the thing to do when in Gold Coast. 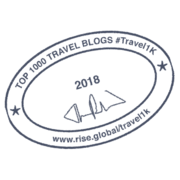 And just for that – don’t forget to add this pin to your travel list. There is no public transport to the Springbrook National Park. You will need to rent a car and drive yourself or book yourself into one of the tours that take you to this park. The one that we used was Southern Cross 4WD Tours. It can get a little nippy when in the Gold Coast Hinterland. A warm jacket and closed shoes are recommended. Flat shoes would be the most comfortable. 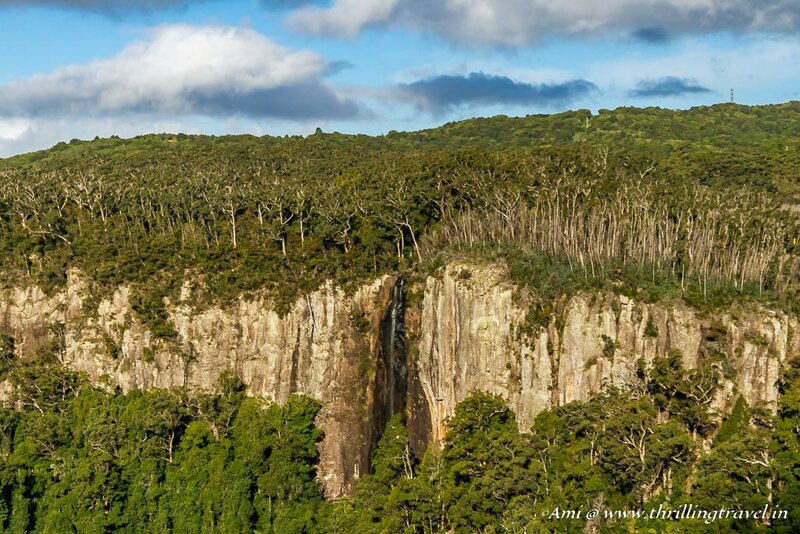 Please note that the Springbrook National Park is a protected area. Please do not harm the flora and fauna here. If you are keen on Bird-watching, make sure you carry your binoculars with you. Also, you might want to go for a personalized tour if that is the case, for this activity needs a lot more time than what you get on a guided tour. There are no restaurants along the way. There is only one cafe near the Best of Lookouts, where you can get some fresh bakes and coffee. Public restrooms are available at all these locations. 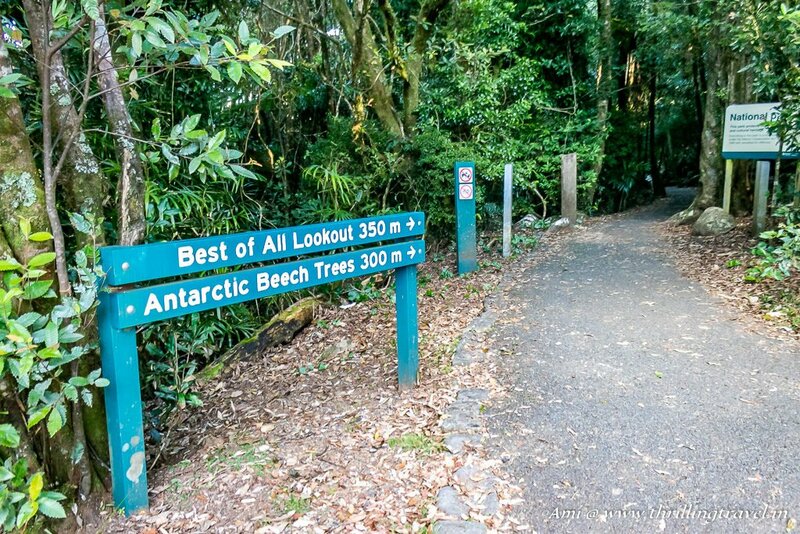 The Gold Coast Hinterland has plenty of other trails and national parks. 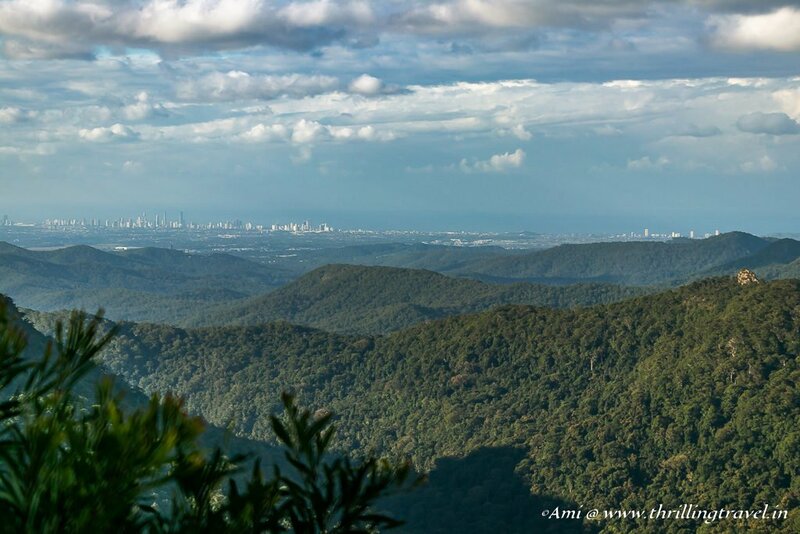 Lamington National Park and Mount Tambourine are two other destinations. 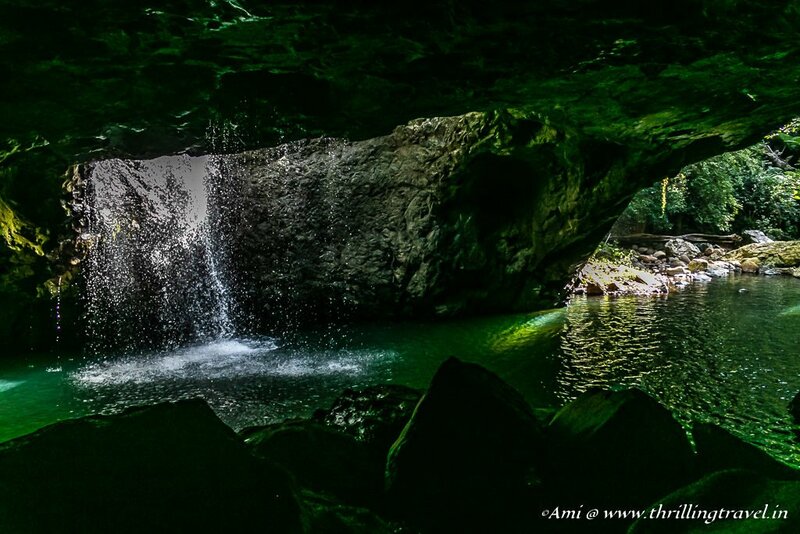 Even within Springbrook National Park, you can try out the other trails like the Twin Falls trail. Holy! This looks like an oasis! Beautiful! It’s officially on my list. It sure is. Glad you added it to your list. Ha ha. Yes. The simplicity of names is endearing and amusing too. Loved them all. Those photos look incredible! I love that lush vegetation! Definitely adding this place to my travel list! Glad you like it. It is worth a visit. The Natural Bridge Cavern looks like a place outside of Austin called Hamilton Pool. The natural park really is a gorgeous place and on my list once I finally get to Australia. As someone who knows the Gold Coast well, I can say without any doubt that this is such a great post that includes so much that the average person just doesn’t know exists there. The Gold Coast is famous mostly for its beautiful beaches but so many people don’t even know anything at all about the massive green hinterland sitting right behind it. Springbrook National Park (as you point out) is just one of the regions within the hinterland that has such amazing nature to enjoy. The Natural Bridge is definitely a magical highlight but the extent of walking treks, waterfalls and scenic views is truly abundant. I loved reading this post even more than coverage of the hot air balloon you experienced right before this. So well done, thank you. Wow – this really is something. Those views! And the strangler trees – how interesting. I never heard of them. Strange to imagine trees as parasites like that! There are few of the similar ones in India too that I have seen. They are quite fascinating…the strangler. They create hobbit homes…as in trees with empty shells. You should try see one. Thanks for stopping by, Nell. Gold coast is usually associated with scenic ocean drives. 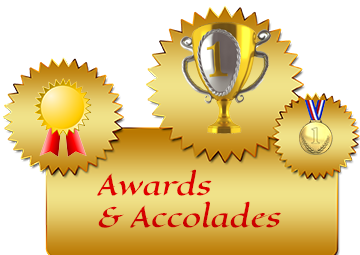 it is great that Queensland Tourism gave you a deeper travel experience. Trekking through a national park, seeing the rich flora and fauna, coming upon waterfalls like you did, I cant think of a better way to spend a day. You betcha, Shweta. So thankful to the Queensland tourism for sharing a different shade of the city. Love the names given to some of the places, they definitely describe what they are. It’s been a long time since we’ve visited Australia and we, like most people, kept to the coast as we passed through the region. We hope to return to Australia in the next few years and we should have more time to explore on this visit. What a stunning national park, and full of natural beauty too. I’d love to visit Australia and see the Gold Coast one day, it looks incredible. You’re right about the Natural Bridge, I’d be oohing too! The waterfalls are equally stunning, just a gorgeous national park. Thank you Lisa. I hope you can experience this in person for yourself. It is worth every ooh that you utter. The hinterland of the Gold Coast really is the complete opposite to the glitz and party atmosphere of Surfers Paradise. 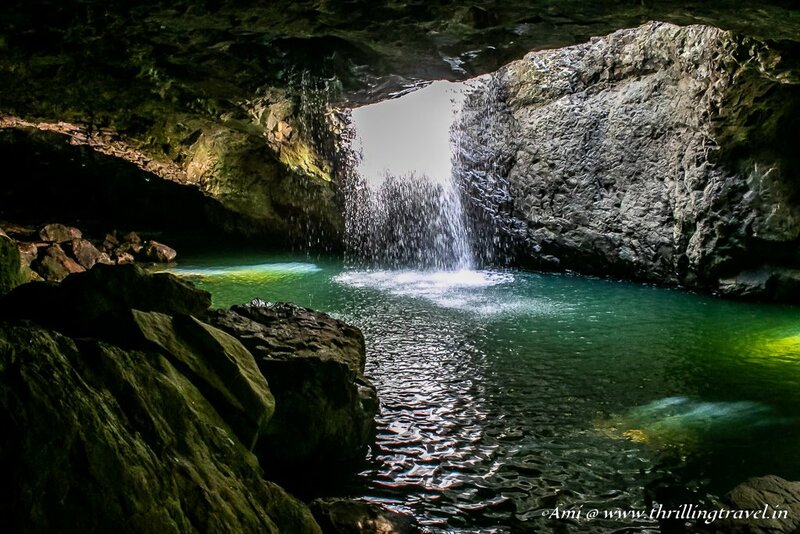 Springbrook National Park looks like the perfect place to escape for a day. The Natural Bridge is beautiful, I totally understand why there was a collective “ooh”, I would have been joining in on that. Love your photo of the Gold Coast from the park. So far away yet so close, and two worlds apart. The SpringBrook National Park sounds like an amazing location packed with amazing natural landscapes, fossils and rich flora. The view of the falls from the cave is spectacular, loved all the pictures. 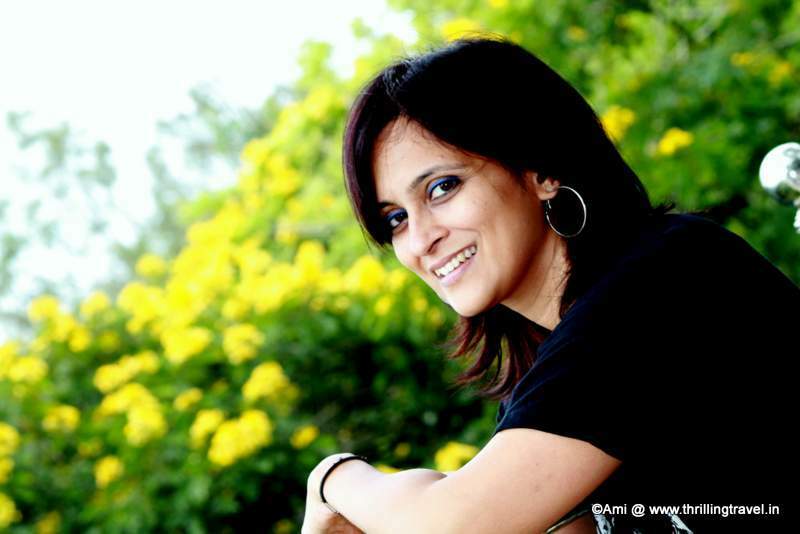 Thank you Rashmi. Glad you enjoyed the post. What a lovely experience to walk through the natural park after seeing it from above in the hot air balloon. I love that there is evidence of the era when our continents were still together as Gondwana. This place looks so amazing! Natural bridge and all best lookout are both just wow. You are right Australians keep the names simple. you reminded me a funny video which compares British with Australians when it comes to choosing the names. I love the humor that they have in these names. Nice discovering the light side of Australia. And also, the scenic parks. This post makes me a little sad because I was supposed to be in Gold Coast in January, but had emergency surgery and had to fly home. 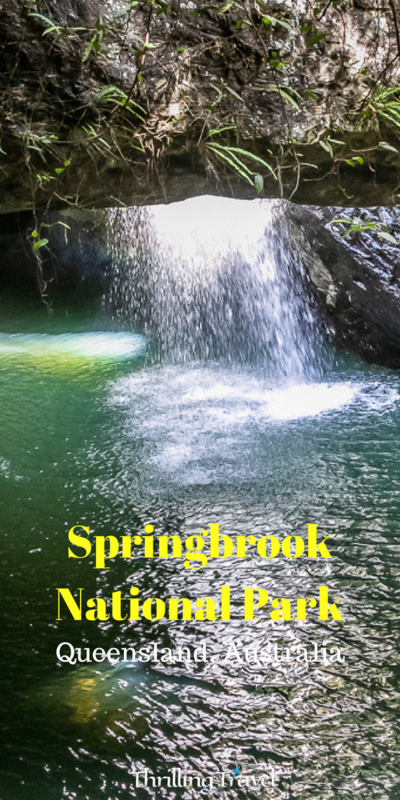 However, it might have been a good thing because I hadn’t heard of Springbrook National Park before this post and now it’s at the top of my Gold Coast list! All of those waterfalls are just so magical. My husband would kill to photograph these gorgeous spots! 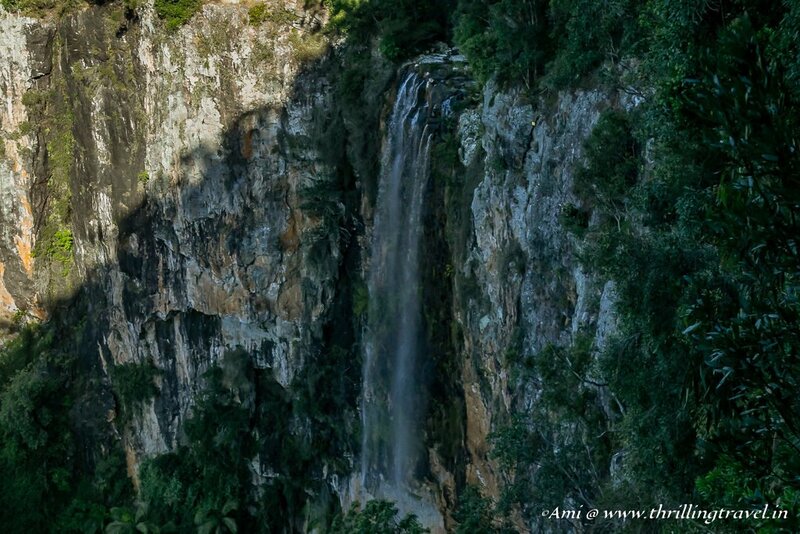 Springbrook National Park looks pretty awesome! I am so happy to have come across this post because I am in the process of creating my itinerary for my trip to Australia next year and since I have limited time, I have to be very careful with what cities & activities I pick and those that I drop. I am definitely visiting Golf Coast and I will have two days there and it seems like Springbrook National Park is a good place to add in my activities. I know for sure my parents, who are travelling with me, would love to experience a hot air balloon ride too! Thanks for this recommendations and detailed post on what to expect. Thanks Medha. Stay tuned for a new post soon on how you can plan Gold Coast. Am sure you will find that useful. Nice post . All the picture of the post is amazing. Following you from a long time. Thank you Ruma. Glad you like my stories. I have family that live nearby here and they’ve talked often about how beautiful it is – and now I know for sure, its just completely stunning! Just looking at those ancient beech trees is incredible – you know they’ve seen so much life changing around them in the park! Time to visit your family, Samantha. Am sure you will have a blast. Public toilet/ bathroom is a must and should be everywhere so I like this part of the National Park Gold coast since when it gets cold people often run to the toilet. I haven’t been to Australia but of course, it’s always part of my travels around the world. Would love to bird watching here, the last time I was on a trip, we failed to do this because of heavy rain! The best is here is the best of all lookout! The Gold Coast itself is one of my top bucket list destinations and this is another jewel to add to it. The spring brook national park seems a great place to visit and a nature lovers paradise. The purlingbrook fall and canyon has some breathtaking views and as you mentioned it’s not just for pro hikers. Overall seems to be a great place to visit if you around the area. Thanks for sharing. Hope you do – it is a lovely place indeed! It sure is breathtaking. I was in awe when I saw it. Am sure you too will be! Springbok National Park seems to epitomize the best of the famed Australian outdoors. The nature trails look absolutely breathtaking. The Natural Bridge and the trail leading to it look really spectacular. Definitely a paradise for nature lovers like us. An absolute paradise not just for nature lovers but even heritage buffs. They sure will find the old trees and hidden fossils interesting.